To get the best results, you need to communicate the specifics you need in an effective manner. Often, that involves getting together with machine shop personnel either by going to them or having them come to you, depending on the situation. Obviously, that is going to be far easier with a local machine shop. One aspect of concern when having a part fabricated is the roughness of the surface. If you work with a local machine shop, you’ll be able to view various samples and get their recommendation about smoothness and polish. Going beyond the roughness, there are other aspects involved with choosing the right material, so you get the results you desire at the lowest cost possible. With a local machine shop, you can go over your expectations for cost of production as well as usability and durability, so you can get the results you need for your project. It is always easier to get prototypes when working with a local machine shop and once the final part is ready, they will usually install it for you when you are in the same area. You lose this option if you work with a machine shop out of the area. 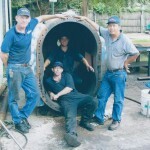 Your best bet for a reliable and professional machine shop in the Orlando area is Pat’s Pump & Blower. We are a full-service operation that offers repairs and sales of pumps, blowers, and other equipment. We are happy to provide on-site inspections at your business at no charge to you. We also offer emergency services 24 hours a day to reduce the downtime you’ll experience after an equipment breakdown. Buying local is always a good thing, but when it comes to machine shop services, there is simply no better way to go. Call today to learn more!